Beacon Villages | "Where little ones and those who love them eat, play & learn"
"Where little ones and those who love them eat, play & learn"
It’s been a busy past few months and I hope to get back to posting a bit more regularly soon. In the meantime, enjoy this updated video of A.J. drumming. Thanks for watching! 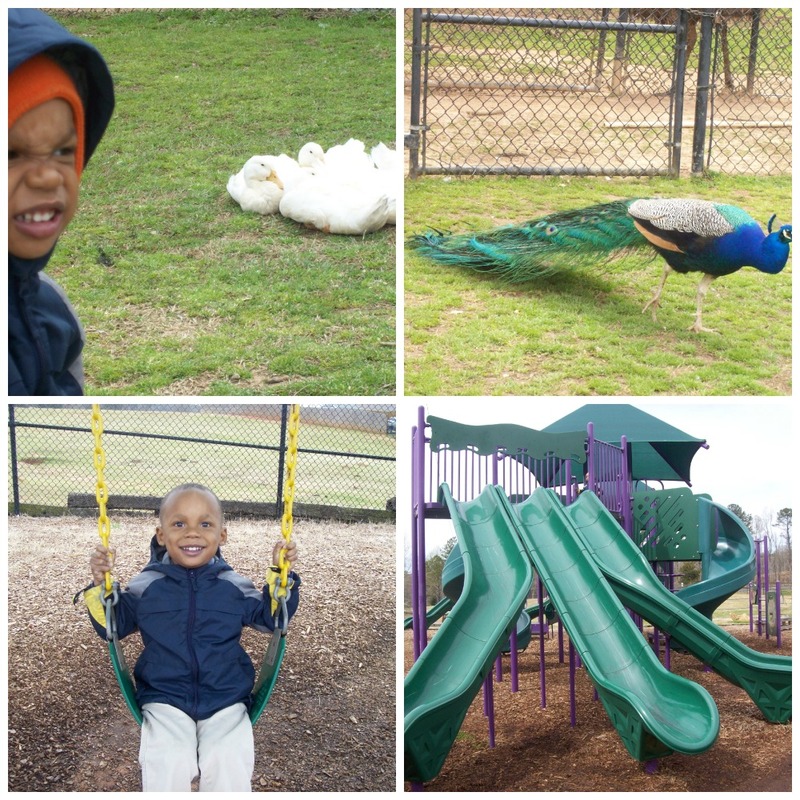 This is the final post about activities we did in March. 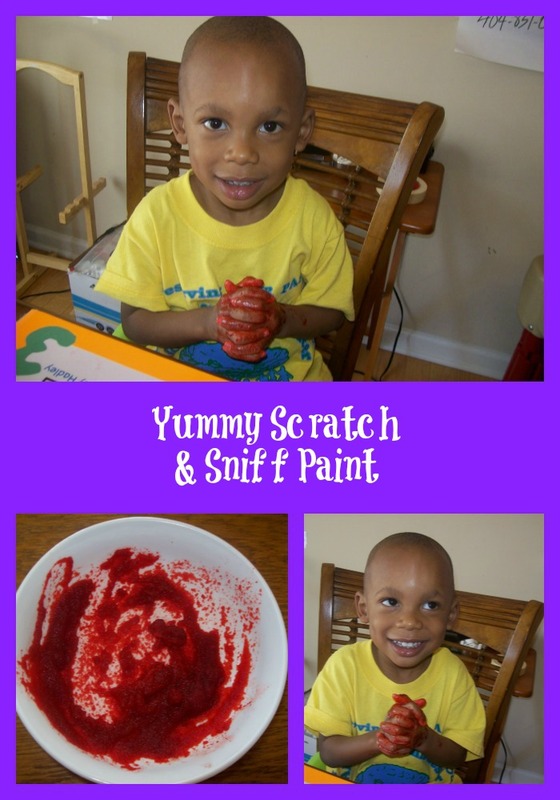 Our last craft was creating scratch & sniff paint. Mix flavored gelatin as directed using very little water. There are many flavors available. We chose strawberry. You don’t want the paint too watery, but instead, stiff and grainy so add very little water. The first time we made the paint, we used too much water and accidentally ended up making jello, which we threw away because we don’t eat this “frankinfood.” As you can see from the above picture where A.J. is hunched over the bowl smelling the liquid, we used too much water. The mixture in the the last photo above is a better texture. Simply use the mixture as paint. From our experience, the dried paint gets really hard which makes scratching the paint very difficult. However the aroma of the “paint” while making it and painting actually smells great! Venturing to the library on Wednesdays are a lot fun for us all. 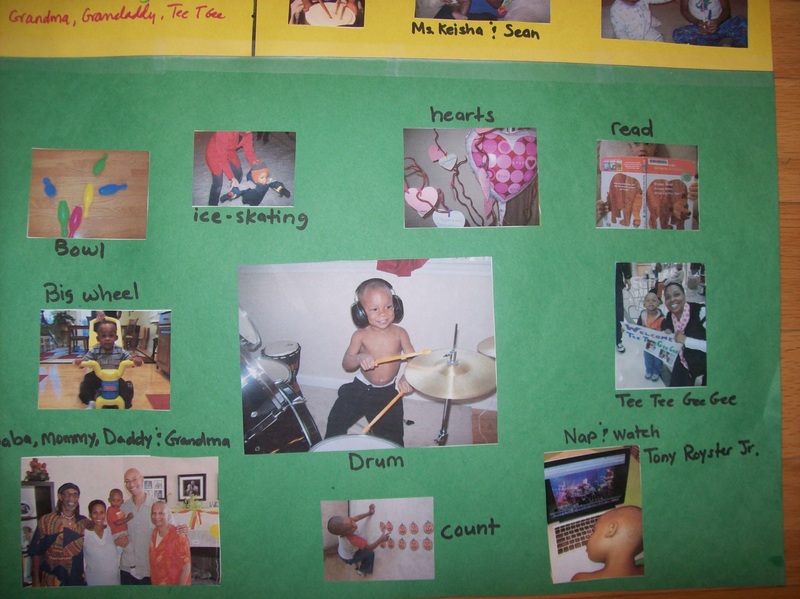 Going consistently is a great way to meet new kids and their caregivers. 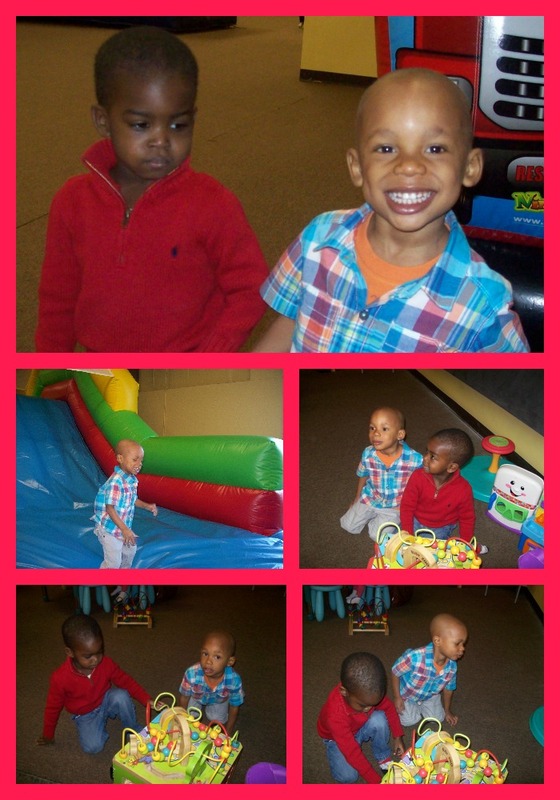 We had an especially good time a few weeks ago when A.J.s friend Yasmine celebrated her second birthday. Her grandmother brought mini cupcakes, goody bags with treats. We also had an Easter Egg Hunt that day, so the day was full of surprises. Instead of hunting for eggs, A.J. was more interested in eating the cup cakes sitting on the tables. I helped organize an Easter Egg Hunt for our subdivision that turned out really nicely, except I left my phone and digital camera at home. So no pictures. A.J. didn’t have a nap that day and you can guess what happened outside in front of all the neighbors right after I finished praying a grandiose prayer talking about how we want our kids to know that we love them and how they should obey their parents…yada yada yada…and my child starts rolling around the grass screaming because he is now sleepy. After I dragged and carried him home, he settled down and returned to the egg hunt with his dad like nothing ever happened. 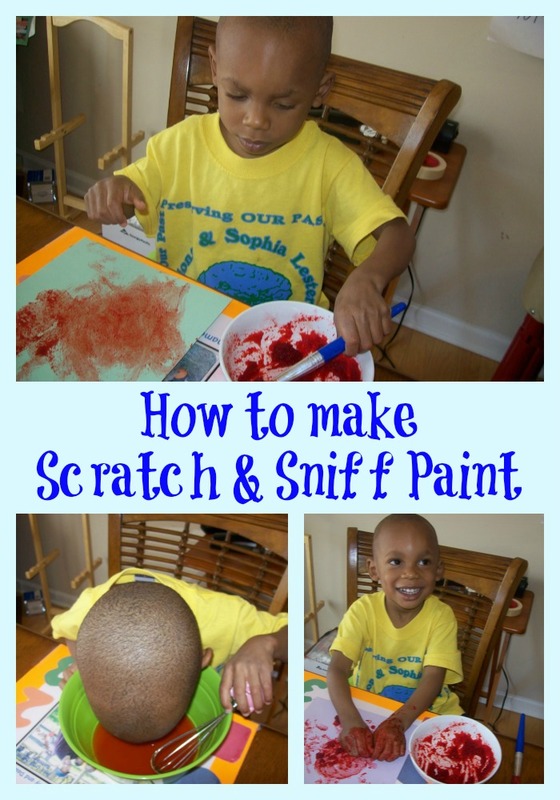 Do you have any fun paint recipes to share? 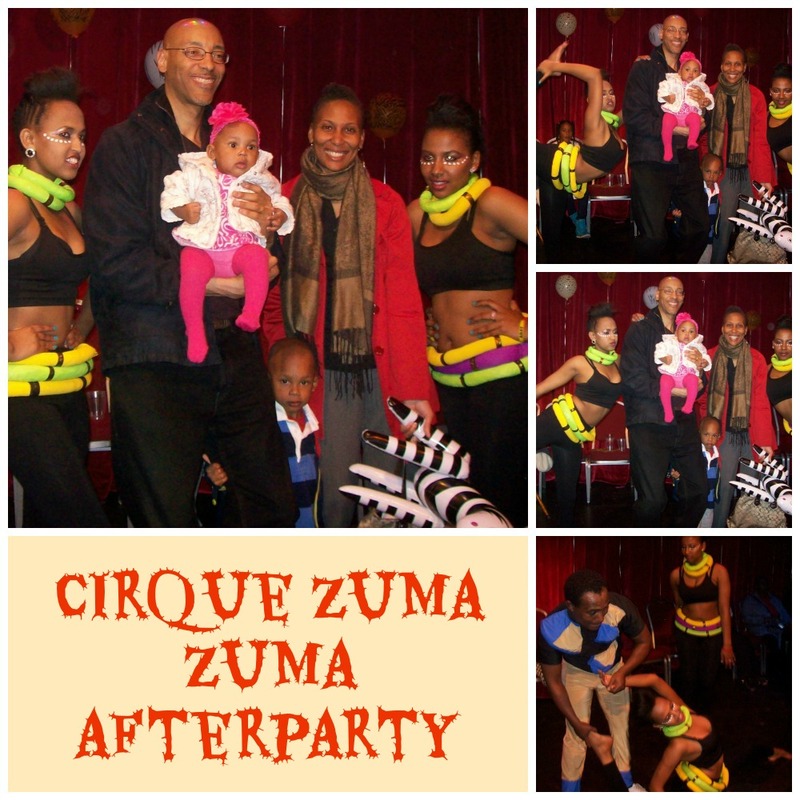 I’m still writing posts about some of our adventures in March and attending Cirque Zuma Zuma in Carrollton, GA was certainly a highlight. Cirque Zuma Zuma is the African version of Cirque du Soleil. The entertainers were doing all sorts of crazy feats like climbing a pole upside down, juggling tables with their feet, contorting their bodies, climbing unstable chairs stacked at unbelievable heights and more. Amira seemed very comfortable in the water. I think she will do very well in the ISR swimming. Hopefully we can get her lessons soon. Perhaps her swimming will inspire A.J. 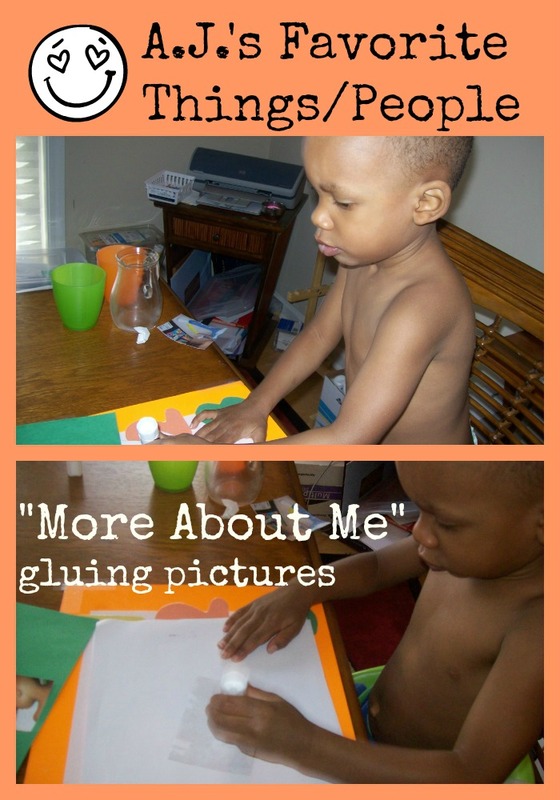 Would you or anyone you know be interested in posting about a fun activity that you do with your little one(s)? If so, shoot me an e-mail at asiamhadley@yahoo.com. Last week A.J. and his buddy ManMan enjoyed a leapin’ good time at Leapin’ Lizards. They bounced and jumped around which of course made nap time seamless. Bouncy houses are great for gross motor skills development, too! 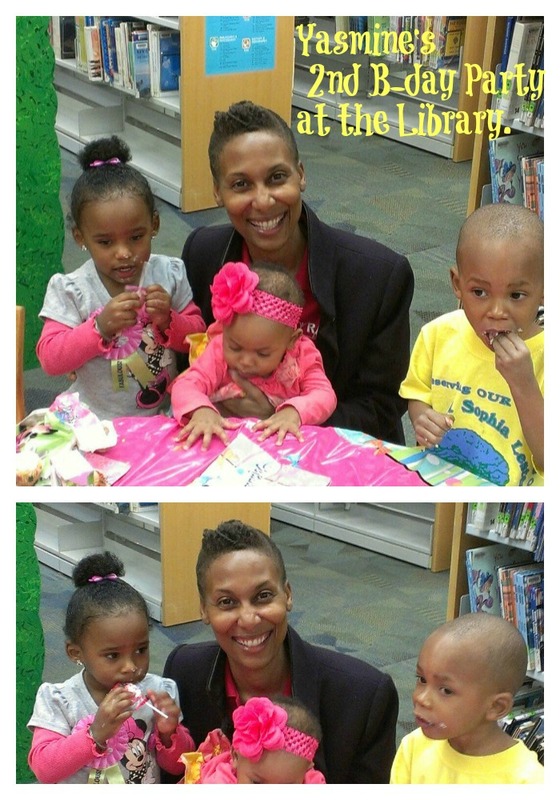 Amira giggled and cooed as she excitedly watched the kids bounce. 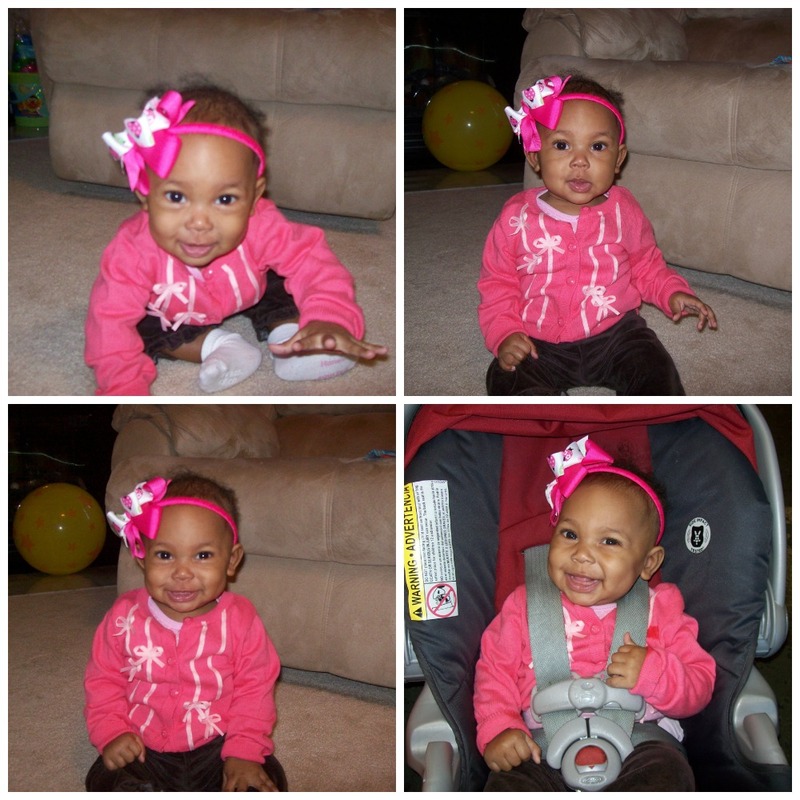 These are pictures of her before we left the house. Isn’t she a cutie!! How did your little one(s) burn off some energy this week? 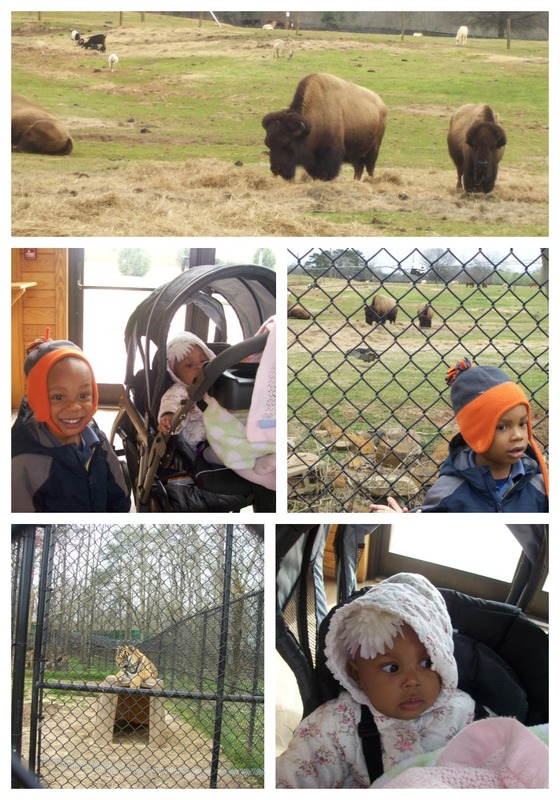 Last week we ventured to Noah’s Ark, an animal sanctuary that’s home to over 1,000 animals. Our double stroller came in handy as I strolled A.J. and Amira around the sprawling park. A.J. got out when he wanted so that he could see the animals up close. This was our second visit and Amira’s first. I was with my good friend Harolyn and her family the first time we went. I didn’t know about this sanctuary until she told me about it. 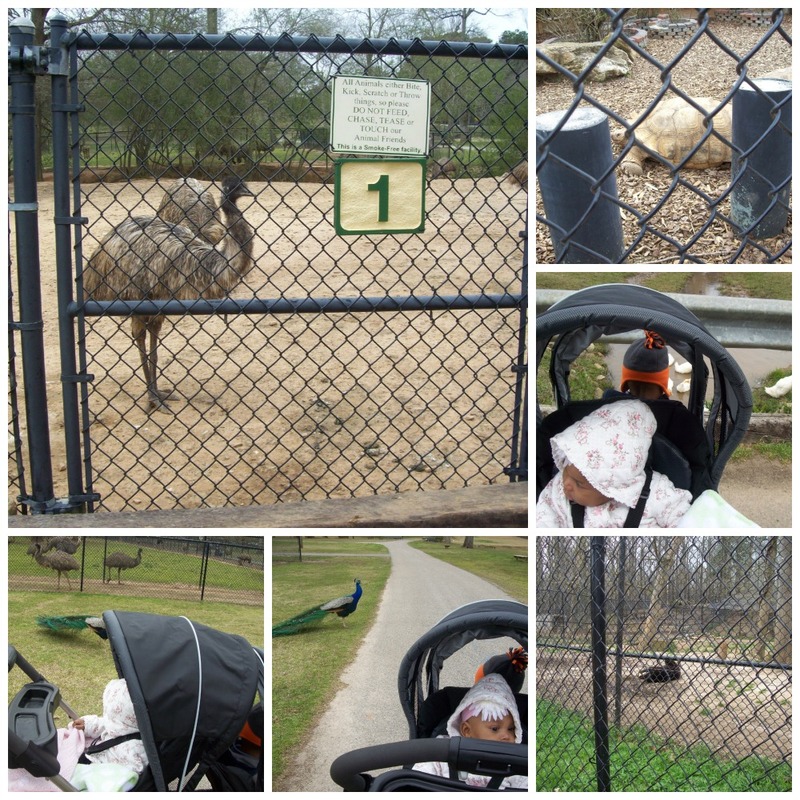 On this visit, we were able to see all types of birds, peacocks, emus, bison, tigers, bears, ducks, turtles, and snakes. We had such a good time. I look forward to our next visit. Next time, we will go earlier in the morning so that we can eat lunch at the picnic tables. They even had a nice play area! Where did you go for your latest adventure? Spell, Listen & Count for Fun! This week has flown by and so much has happened in such a short amount of time. To start, the family and I are getting over Montezuma’s Revenge. I was hit the hardest. Thankfully, I’m feeling sooooo much better and so is everyone else. It started with food poisoning from an Ethiopian Restaurant but my stomach ache was compounded by a bad veggie patty from a Subway. Amira’s sniffles have subsided, so I finally put her in her crib for the first time. We’ve been co-sleeping since she grew out of her bassinet. She literally started kicking me out of the bed and sleep became unproductive for the both of us. So it was time. Yay! She adjusted with a hitch. No wailing. A few whimpers, but that was to settle herself in before going to sleep. What a tremendous blessing! I think my early experience with A.J. sort of scared me, but after I was consistent, he adjusted well too. 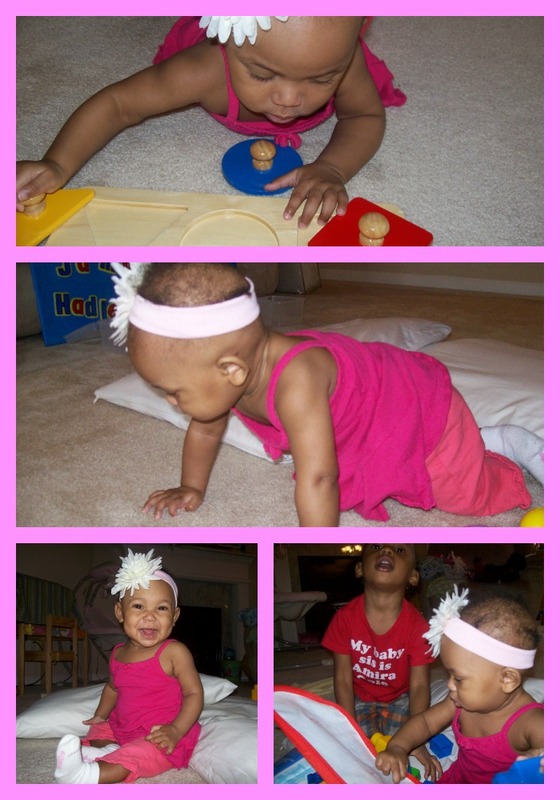 Here are a few pictures of Amira playing and joining in on the fun A.J. and I have when we play and learn. As you can see, she can now put herself into a crawling position. 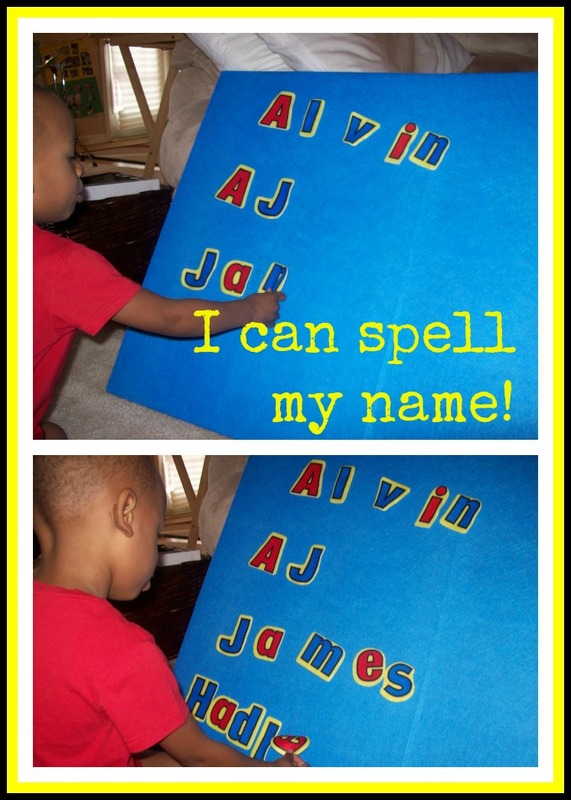 Since this month’s theme is “All About Me.” We spent time reinforcing how to spell A.J.’s full name. It was easy for him to learn how to spell his names, but adding the letters in the proper order provided another learning opportunity. 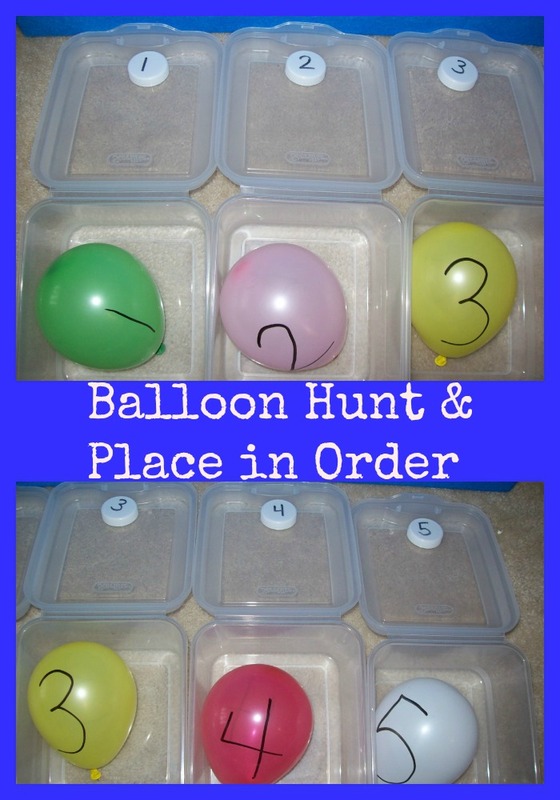 We’re always counting, so I found this cool balloon hunt activity from The Activity Mom’s site that I modified and played with A.J. He loved it so much that he would scream each time he found a balloon. I simply hid the numbered balloons. Each time he found one he had to put it in the proper clear bin. To make it easier, as finding the balloons were challenging enough, I put the numbered bottled caps in the tops of each bin. 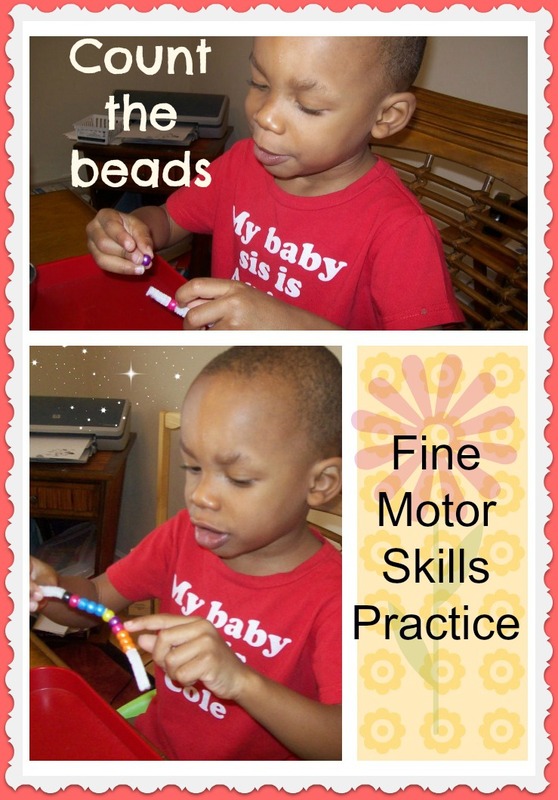 Another counting activity that we did combined fine motor skills work. We are also learning about the senses and for a listening activity I placed bells inside of eggs and had him shake them to see if he could tell which egg had the most bells, or which egg was the loudest. Then he ordered them from loudest to softest. 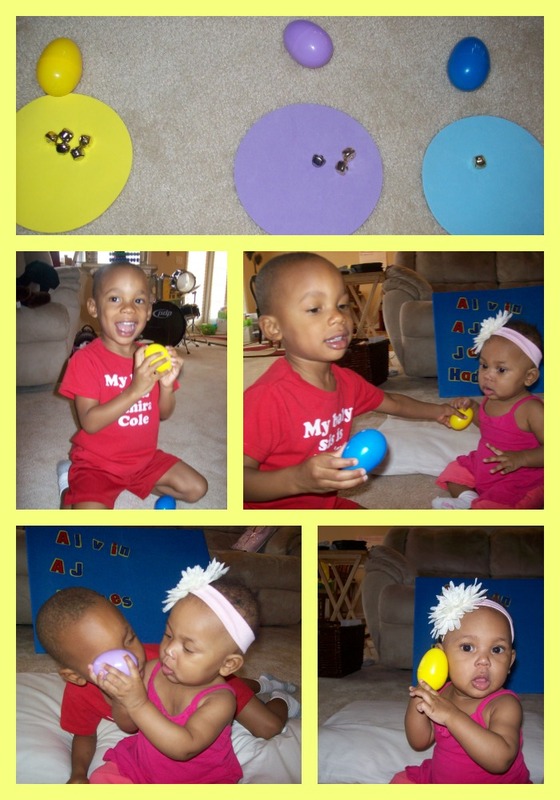 Amira shook the eggs, too! I still have some wonderful adventures to post about, but I will have to do it sometime this week. Thanks for reading my blog and I hope that if you find any activities that you think other parents may enjoy doing with their little one, by all means share this post and my blog! Oh, by the way…I surpassed 5,000 views on my blog! Yippee! This is just the beginning! Congratulations to me! What other fun counting games have you played recently? Originally when I planned our activities for the month I didn’t realize Easter falls in March this year. I will include some Easter crafts as well as material about how we at Hillside interpret the meaning of Easter. To put it short, it’s about resurrecting your mind with new thoughts and ideas, something you can do anytime! A.J. is playing with Easter grass in the photos above. 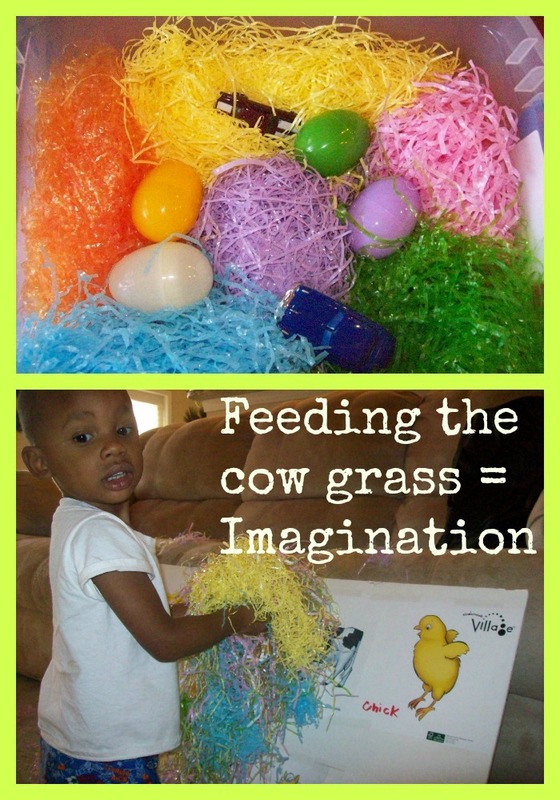 It was his idea to take the grass and feed it to the cow in the picture. He’s really starting to use his imagination. 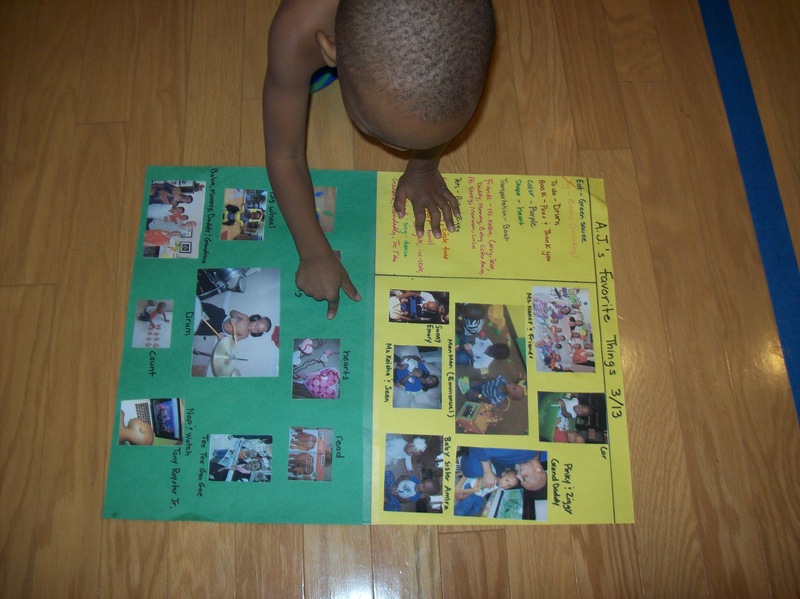 When we read books he enjoys acting out the various parts and loves when I join him. Usually I don’t mind, but I must admit that sometimes I just want to sit down and read instead of getting up every other second to pretend to climb a mountain or whatever the book is talking about. Since this month’s theme is “All About Me,” A.J. shared about some of his favorite things/people. Talking about what he enjoys encompasses a lot, but I tried to write what he said instead of what I thought he should say. Because I’m going to laminate this project and turn it into a place mat, I helped out more than I probably should have with the placement of the pictures. A.J. did glue most of the pictures. I often catch him looking at the pictures with a beautiful smile on his face. PRICELESS!! 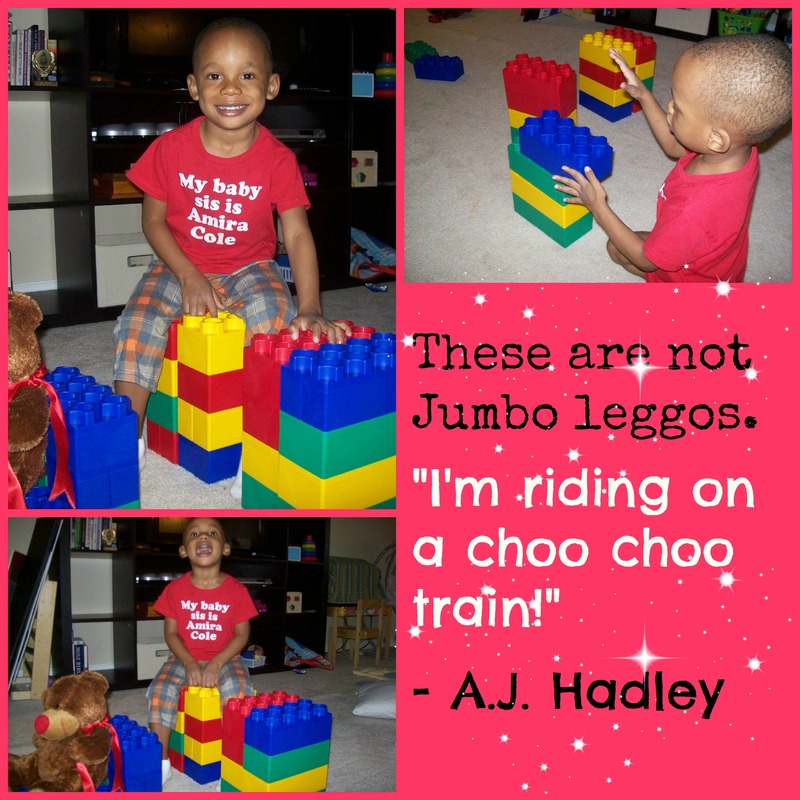 How does your little one use his or her imagination these days? Hi, I'm Asia! I'm a wife and mommy of two precious little ones. A.J. is a two year-old spirited little drummer boy and Amira is our 2 month-old cover kicker. They keep us going, especially me since I'm home with them most of the time. We are far from perfect, but are grateful for the perfection in each moment. Here you will find Montessori inspired crafty, creative and cost effective fun learning activities that I do with my little ones sprinkled with pieces from my journey to eat more living foods. I love hearing from you, so feel free to share what's on your mind in the comments section.